Review: Babymouse Burns Rubber is a classic tale of how a little fiction animal follows her dreams. Jennifer L. Holm and Matthew Holm did a fantastic job with this book. This book simply has everything. It starts with a dream and then Babymouse nearly reaches her dream of driving in the Downhill derby. The book also includes the always important good deed. Babymouse Burns Rubber is the tenth book in the series. The book begins with Babymouse riding her bike to school. However she looses focus and thinks she is in a race car and of course she crashes. After school she goes to her best friend Wilson’s house so he can fix her bike. Meanwhile she spots Wilson’s race car. It is at that very moment that Babymouse learns about the Downhill Derby. She knows that that is her time to shine. She wants to win extremely badly. In order to enter, she has to make her own vehicle. She dreams about the perfect ride and goes home and starts making a car of random junk. It doesn’t work out that well. Through a series of mishaps, Babymouse finds she eventually ready to fulfill her greatest dream, but her conscience stands in her way. What will she do? This book is filled with passion, adventure, and humor, all the ingredients to a great book. I personally thought this was an amazing book. I had a few laughs every once and a while. And, it ends with a wonderful message for all children. Certainly,-children as young as 7 could read this book because the vocabulary was not very big. Plus it is a high-interest book-especially for early readers. Babymouse Burns Rubber is an inspiring book. I look forward to the eleventh book! Review written by Sara (6th grade student). We would like to thank Random House for providing a copy of BABYMOUSE #12: Burns Rubber for this review. 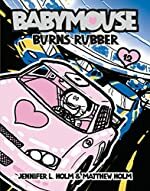 Have you read BABYMOUSE #12: Burns Rubber? How would you rate it?